The Independence Clear Mugs are high quality drinking cups designed to be easily picked up and held. And they have a wide base which makes them easy to set down without tipping or spilling. Each mug comes with two specialty lids to suit every need. . Made from clear plastic, these mug are practically unbreakable, will not cloud, and never impart a flavor. The 2 Handle Mug can be used alone or with either of the included 2 lids. The spout lid has a contoured spout to fit comfortably in the mouth. The anti-splash lid prevents splashing and helps to direct the flow of liquid into the mouth. 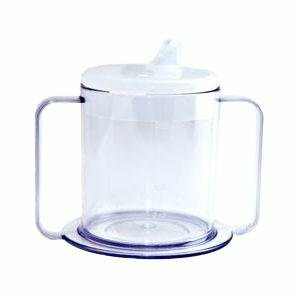 Both lids allow the flow of liquid to be regulated and can be used with a straw. Holds approximately 9 oz. Extra replacement lids are available to fit all of the Independence Cups and Mugs. Hygiene item. Not Returnable once used.